This is my first review of a book at Amazon, but I was moved to write because this book does not deserve the three star rating given by the only other reviewer. 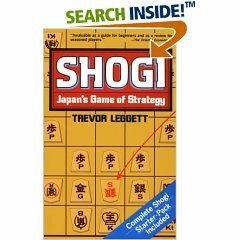 While it is true that (until recently) this was the only book in English about Shogi, it is in my opinion a much better introduction than most beginning books on chess. Trevor starts with the rules of chess, and quickly converts that knowledge into how the pieces move in Shogi, adding info where needed. Then he offers an (admittedly brief) introduction to two different opening styles (like King's pawn vs Queen's pawn openings if you will). He uses the game with mistakes as an illustration because, as a beginner, one learns more from mistakes than from flawless master-level play. I have lived in Japan now for four years and have had ample opportunity to see such high-level play -- it baffles me. Still, with this book, I have turned my chess skills into a moderate level Shogi game. I've even won a few games against some friends. In the end, this book hooked me on Shogi. It is a great game, and this book does much to take you from beginner to moderate player (I recommend a computer game to help you learn too).